Hiding keyboard in android device is one of the common action. In your android mobile device, It will show you soft keyboard on screen automatically when you type text in text box of software app so it will hide some of the elements. Now supposing you wants to select value from drop down which is hidden behind android keyboard. For that, You need to hide android keyboard first so that you can see drop down and then you can select value from it. 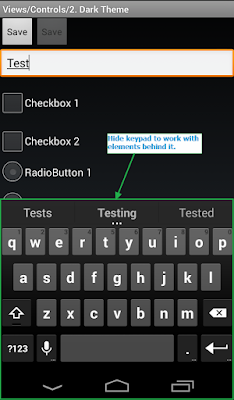 In android appium software automation test, It is very easy to hide android keyboard using hideKeyboard() method of AndroidDriver. Let's learn how to hide android keyboard in appium software automation test. We will use same API Demos software app In this keyboard hiding test. Main aim of this appium software automation test is to hide android soft keyboard after typing text in text box as shown in bellow image. Manually you can view above screen in API Demos software app from API Demos app's Home -> Views -> Controls -> 2. Dark Theme. Create bellow given Keyboard hiding appium test eclipse. Run above test in eclipse using testng and appium. 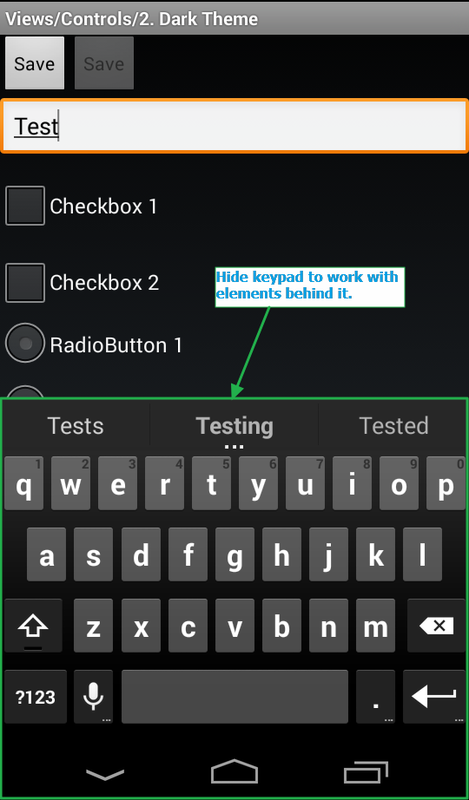 Last syntax of @Test method will hide android keyboard. This way you can hide keyboard of android device in appium android software automation testing. How is it different than sending the keycode to hit the back button? Pero después de terminar la prueba mi smartphone ya no me muestra el teclado, solo muestra una pantalla negra y se oculta automáticamente. Agradezco su ayuda. Scroll() method is deprecated can you please tell me what is alternative method is use to ?